The Kennedy Center’s “Broadway Center Stage” series has yet again brought us one of America’s most beloved musicals. 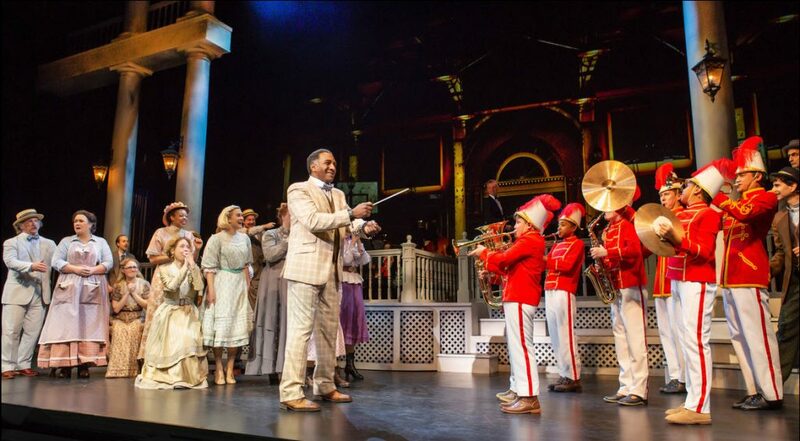 Described as a “semi-staged concert format” in which the actors are meant to perform with their scripts in hand, this production of The Music Man goes far beyond that, offering a complete and beautifully staged rendering of this heartwarming Meredith Willson show. The story of the shyster showman (or as Mayor Shinn played by Mark Linn-Baker calls him, “a spellbinder”) who comes to River City to deliver the country folk from the evils of a newly installed pool table only to hoodwink them on the notion of a kids’ marching band, is as relevant today as it was when it won the Tony Award for “Best Musical” in 1958. What makes this show as fresh as corn husks off a cob, are the cast – well-known Broadway stars dazzling in leading roles and led by legendary director Marc Bruni – plus the sets and the snappy choreography. 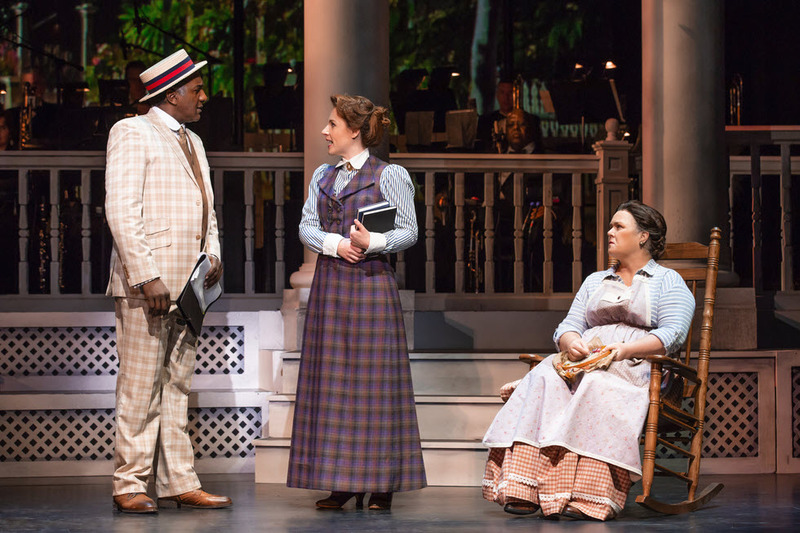 Norm Lewis, who played the first African-American Phantom in Phantom of the Opera, and garnered a Tony nom for Porgy and Bess, plays Professor Harold Hill to Jessie Mueller’s Marian (Madame Librarian). Mueller another member of Broadway royalty earned her Tony noms for Waitress and On a Clear Day winning in 2014 as “Lead Actress” for Beautiful: The Carole King Musical. You could just bathe yourself in her golden voice. Other Broadway celebs are comic and TV star Rosie O’Donnell in the role of Mrs. Paroo, Marian’s Irish mother; veteran charmer Veanne Cox as Eulalie Mackechnie, the Mayor’s wife; and John Cariani whom you’ll recognize from his role in The Band’s Visit as Itzik and his Outer Critic’s Circle award-winning nom for Something Rotten! The opening scene with traveling salesmen on a herky-jerky train ride brings it all back. They are gossiping about Hill and his reputation as a conman and threatening to blow his cover. But Hill is sitting in the back row, secretly listening and decides he’ll swindle the good-hearted folks of River City. 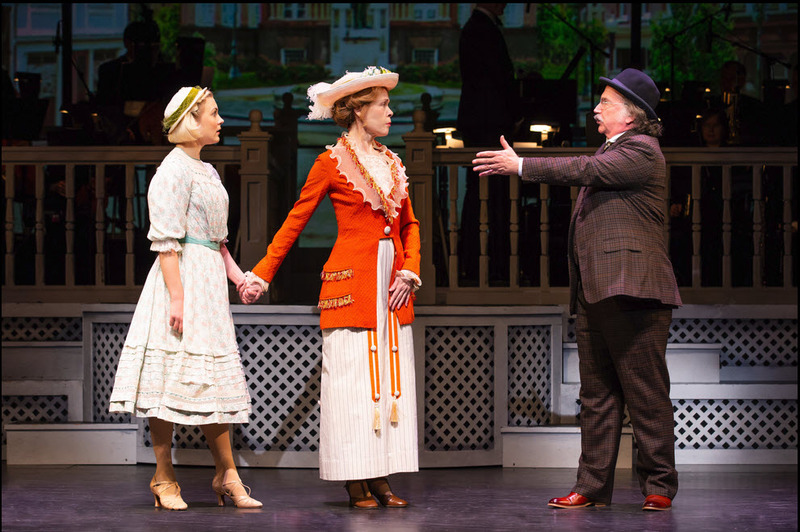 The music ranges from waltzes and marches to lively syncopated tunes and a sweetly mellifluous barbershop quartet who break into song whenever the tension ratchets up. 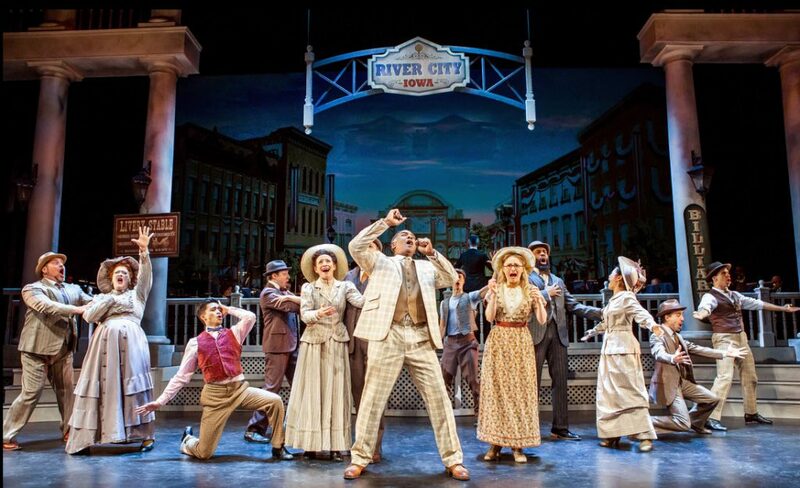 Enough can’t be said about the gorgeous set design and projections by Paul Tate dePoo III who gives us iconic floor-to-rafter scenes of small-town America. And you will thrill to hear Conductor James Moore’s 20-piece orchestra in full view center stage. Moore gifts us with knowing expressions allowing us to feel like we’re on the inside track. Highly recommended. If there is a ticket left, grab it and go! And take the kids too. Pro Tip: Stay in your seats to hear the University of Maryland trombone section march down the aisles as the cast take their bows. Its epic! Also starring Damon J. Gillespie, Arlo Hill, Todd Horman, Eloise Kropp, Emmy Elizabeth Liu-Wang, Liz McCartney, Sam Middleton, David Pittu, Hayley Podschun, Jimmy Smagula, Nicholas Ward, Malcolm Fuller, Denis Lambert, Katerina Papacostas, Vivian Poe, Noelle Robinson, local actor and recent Helen Hayes Award winner Blakely Slaybaugh, Ryan Steele, Owen Tabaka, Daryl Tofa, Diana Vaden and Jessica Wu. Choreographed by Chris Bailey with Lighting Design by Cory Pattak and Sound Design by Kai Harada. Through February 11th in the Eisenhower Theater at The John F. Kennedy Center for the Performing Arts, 2700 F St., NW, Washington, DC. For tickets and information call 202 467-4600 or visit www.Kennedy-Center.org.